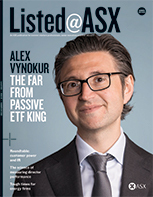 Stay informed with our Listed@ASX magazine – a publication for investor relations (IR) professionals, senior executives, and their advisers. 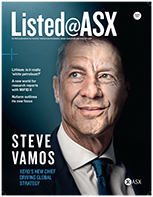 The app also includes the regular ASX Compliance Updates (formerly known as the 'Listed Entities Update') and the 2015 regulatory reporting calendar for companies with a March, June, September or December balance date. 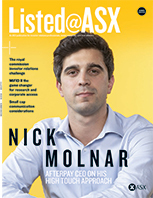 Both the Listed@ASX magazine and associated app are free. No app login is required. Ensure your voice is heard by responding and commenting on magazine articles. For further information and technical support with the app, please view the FAQs. 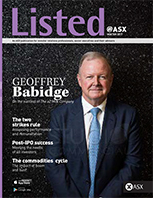 Should you wish to unsubscribe from the print edition mailing list, please write 'REMOVE' in the subject line.